Gabion is a rectangular wire mesh box comprised of three one half turns (commonly called double twisted) to form hexagonal shaped mesh openings of Zinc galvanized and PVC coated steel wire. These mesh openings are then interconnected with adjacent wires to form hexagonal meshes. Selvedge / Edge wire which is a thicker and heavier wire is used to reinforce the edges and transverse diaphragm. 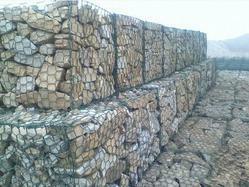 It gives greater rigidity and shape to the gabion/mattresses/netting. Construct temporary or permanent retaining walls and channel linings. Gabions are an excellent solution for use when a gabion wall, or revetment needs a stronger than normal face. The units can be used where there are higher loads within the gabion structure or in situations where a higher abrasion resistance is required on the face of the gabion. This can occur for example in river or lake works where there is the risk of ice movement and increased potential for damage.